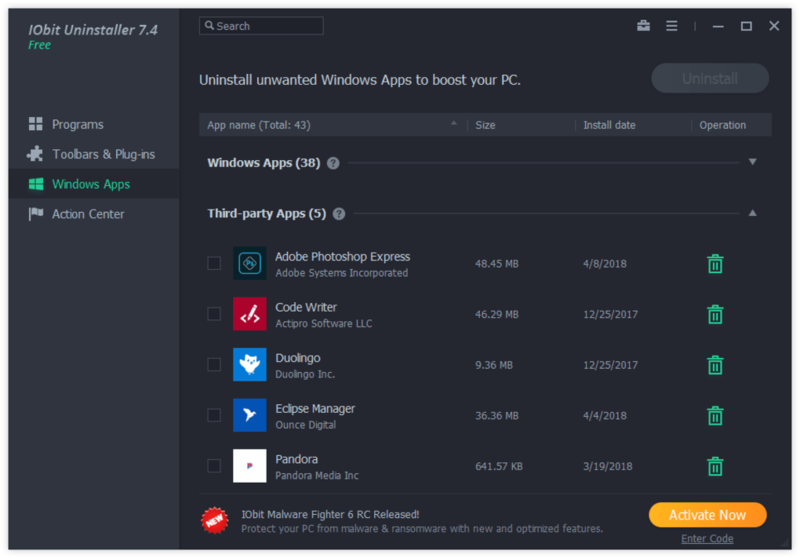 IObit Uninstaller helps you uninstall and remove unwanted programs and folders from your computer fast and easily. Where the built-in and sluggish "Windows Add or Remove Programs" option fails, IObit Uninstaller works as always and picks up the slack. This application requires administrative rights. 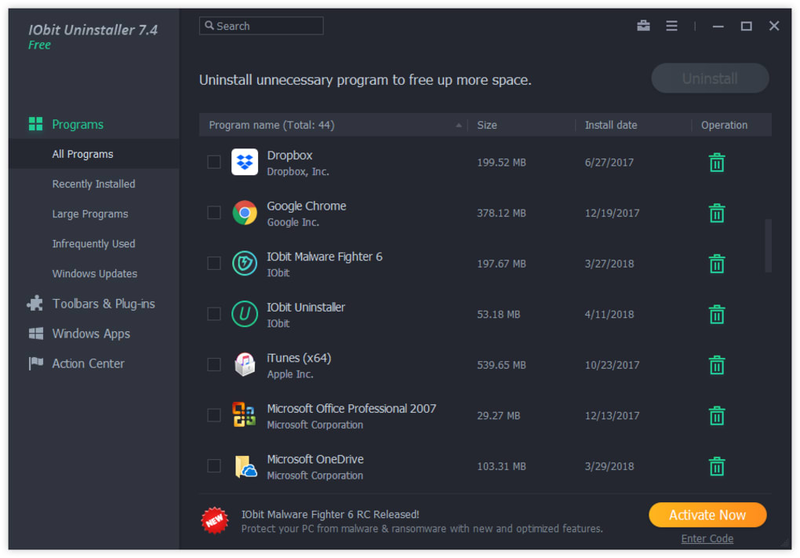 IObit Uninstaller helps you uninstall and remove unwanted programs and folders from your computer fast and easily. Where the built-in and sluggish "Windows Add or Remove Programs" option fails, IObit Uninstaller works as always and picks up the slack. This application requires administrative rights. The tool creates a system restore point as a backup measure, runs the default uninstaller of a program, scans the computer for leftover files and entries, and deletes them. However, apart from the default uninstaller, all these steps and file shredding are optional. These were the highlight features of this programs uninstaller. IObit Uninstaller combines professional options in an attractive, well-organized and highly intuitive interface made for casual and power users alike (while keeping in mind that it's free). Tasks are carried out rapidly while CPU and RAM consumption remains minimal. * Batch Uninstall - Uninstall several applications so easily with just one click. * Standard and Advanced Uninstall - While Standard Uninstall works as the Windows built-in Add/Remove Programs function, Advanced Uninstall function helps you scan Windows registry and hard drive for any possible installation leftovers. * 1-Click Toolbars Removal - Annoyed by so many toolbars in your system? Here's the simplest and fastest solution. * Forced Uninstall - Even a program is not listed in Windows built-in Add/Remove Programs, this feature still can help you automatically find the program's leftovers and traces in your system and remove them completely. * Log Manager and Restoration - Easily view what has been changed by IObit Uninstaller. Every time an "Advanced Uninstall" is performed, a restore point image will be automatically set for possible future system restoration. All IObit Uninstaller Portable reviews, submitted ratings and written comments become the sole property of Windows 7 download. You acknowledge that you, not windows7download, are responsible for the contents of your submission. However, windows7download reserves the right to remove or refuse to post any submission for any reason. Windows 7 Download periodically updates pricing and software information of IObit Uninstaller Portable full version from the publisher, but some information may be out-of-date. You should confirm all information. Using warez version, crack, warez passwords, patches, serial numbers, registration codes, key generator, pirate key, keymaker or keygen for IObit Uninstaller Portable license key is illegal and prevent future development of IObit Uninstaller Portable. Download links are directly from our mirrors or publisher's website, IObit Uninstaller Portable torrent or shared files from free file sharing and free upload services, including Rapidshare, MegaUpload, YouSendIt, SendSpace, DepositFiles, DivShare, HellShare, HotFile, FileServe or MediaFire, are not used.